This is Johann’s second album for Touch, after the highly acclaimed Englabörn. 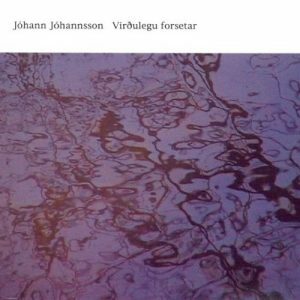 Virðulegu Forsetar contains one hour-long piece for 11 brass players, percussion, electronics, organs and piano. It’s presented as an ordinary stereo CD and as a DVD-Audio with a high resolution 5.1 surround mix. The piece had its live debut in Hallgrimskirkja, a large church in Reykjavik and the city’s towering edifice, and was named the most memorable musical event of 2003 in Iceland’s leading newspaper. The piece has Englabörn’s quiet, elegiac beauty, but abandons the brevity of the first album’s exquisite miniatures in favor of an extended form that reveals a long, slow process. A simple theme played by the brass section is repeated throughout the entire piece using different voicings and instrumentation. As the piece goes on, the tempo slows down, until it is extremely slow. Around the middle of the piece, the tempo starts to speed up again, until it reaches the original tempo. Space and the sense of place were very important in the performance and recording of the piece. Players were positioned both in front and at the back of the church and two organs were used, again, one in front and one at the back. This created a sense of immersion and a sound that is powerful without ever being loud. As the piece is written for a specific location, it made sense to record it live in this same space and attempt to re-create it for the listener with 5.1 surround technology. This was like creating an audio mold or cast of the inner sonic architecture of the building. In this way, the music engages in a dialogue with the space it’s performed in and the recording process becomes as much a documentation of a place as a documentation of music. Virðulegu Forsetar is performed by the Caput Ensemble, conducted by Gudni Franzson, with Skuli Sverrison on bass and electronics, Matthias M.D. Hemstock on bells, glockenspiel and electronics, Hordur Bragason and Gudmundur Sigurdsson on organs and Johann Johannsson on piano and electronics.